You Are Here: Home > The Reviews for the 2016 Mercedes-Benz C 300 Say It All! The Reviews for the 2016 Mercedes-Benz C 300 Say It All! Often referred to as the “Baby Benz”, the 2016 Mercedes-Benz C 300 Sedan packs a generous amount of power and features into a compact package. To show Alpharetta shoppers just how impressive the C 300 is, we’ve collected a handful of online reviews from respected car gurus and auto industry professionals. Take a look below to see what sets the C 300 apart from others in its class, according to the experts! At its core, the C 300 is a comfortable cruiser with a sporty side. Top-notch handling technologies, including a 7G-TRONIC® automatic transmission, AGILITY CONTROL® suspension, and a Torque Vectoring Brake, put you in control from start to finish. Standard DYNAMIC SELECT® lets you switch between comfort- and sport-oriented drive modes, giving you the freedom to rapidly accelerate with ease or soak up the sights as you drift down open roadways. The all-around sleek look and feel of the C 300 extends to the cabin. Inside, you’ll be treated to a variety of appealing features, such as a flowing dash and console, a freestanding 7-inch display screen, circular air vents, and aluminized finishes. Unlike many of its competitors, such as the BMW 3 Series and Audi A4, the C-Class astounds with features like genuine wood trim, driver memory settings, and an optional touchpad controller. In NHTSA crash tests, the 2016 Mercedes-Benz C 300 scored a top five-star overall safety rating, making it a great choice for safety-conscious drivers. In addition to a variety of basic safety features, such as a network of airbags, stability and traction control, and a rearview camera, the C 300 arms drivers with a handful of assistive technologies. Crosswind Assist, PRESAFE®, ATTENTION ASSIST®, and COLLISION PREVENTION ASSIST PLUS® are all included as standard equipment – a rarity in its segment. Take the C 300 for a Test Run at RBM of Alpharetta! 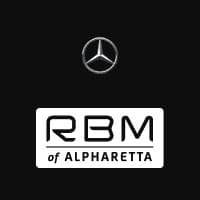 Visit RBM of Alpharetta and see for yourself why the reviews for the 2016 Mercedes-Benz C 300 have been overwhelmingly positive! To schedule a test drive, contact our sales department at . You’ll find us less than 15 minutes from North Point Mall at 345 McFarland Parkway in Alpharetta, GA!